We have barely made it six months into President Donald Trump’s term. And while Democrats were ready to oppose him from day one – Trump’s Presidential honeymoon lasted less than a nanosecond after he was sworn in – no one really expected the 2020 race to begin shaping up until we made it through the 2018 midterm elections. Yet while the incumbent President is a businessman, Delaney thinks he’s not cut out to be a leader. “I think Trump, to some extent, is a punctuation of everything that has broken down with our politics,” said the Congressman in a separate WaPo interview. So he’s going to do things a little differently. As a progressive businessman, I’ve made it a priority to be solutions-oriented and have been consistently recognized as one of the most innovative and bipartisan members of Congress. I’ve done this by simultaneously celebrating the power of our free-market economy while insisting that there is a role for government to set goals and rules of the road and take care of those who are left behind. We need to be smarter, fueled by more investment in science, education and research. We need new ideas on the future of jobs and work, one where we build a stronger and more vibrant middle class. We need to encourage a more just and inclusive form of capitalism and reduce barriers to small-business formation, start-ups, job creation, investment and growth. We need to strengthen our safety-net programs and create a new social contract. We need to reform the systems of education, health care and immigration, and encourage more volunteerism, impact investing and public service. And we need to take affirmative steps to reduce our security, fiscal and climate risks. This is what my campaign will be about. Let me begin at the top. Would it not be fair to say that, in order to have a truly free-market economy, there should be a minimum of government-set rules and goals and a maximum of market-set ones? I’m sure John didn’t wake up every day when he was building his businesses and say to himself, “Gee, how can I meet the specifications and expectations laid out for me by the federal government today?” I know I don’t say that when I consider what to write in my little space. And the problem with the government taking care of those being left behind is that they become overly comfortable in that lifestyle and create generations that don’t aspire to anything more than living off the state. As a Democrat, Delaney has to include the old canards about “investment” (read: more unnecessary spending) in science, education, and research. But what really reveals the game is the idea of a “more just and inclusive form of capitalism.” Capital is as just and as inclusive as the market participants, which I will agree goes in with reducing barriers. But those barriers should be reduced in such as way that no one gets an advantage for themselves – the problem is, as we all know, Democrats will rig the game for certain constituencies in order to buy their votes. All in all, I’ve figured out just what Delaney’s campaign will be about: he will be the arbiter of everything. I mean, he already has a website for his campaign where he has the catchy “D” logo with a highway disappearing into the horizon, and in the video he has there he goes over just how wonderful and peachy everything will be if he’s in charge and in control of everything, because that’s what “progressive” policies entail – government calls the shots and you get what they grudgingly give you. One of the women on the video talks about what a great progressive businessman Delaney is to his employees, and that’s outstanding. But let that be his choice, not forced on every business whether they can afford it or not. Yet there’s another point to be made here as well. Think back to this time on the calendar in 2009, when Barack Obama was perceived as popular – even if many of his policy ideas were not. On the other hand, there’s been little discussion about Trump’s policy ideas (aside from the GOP’s failed attempt to rid us of Obamacare, which Trump was more or less ambivalent about, in all honesty – after all, he was the one who introduced Republicans to the “repeal and replace” concept.) But if you transport yourself to the end of July 2009, the GOP presidential contest was thought to be Sarah Palin’s to lose – but she was months away from announcing her intentions, as were other 2008 and possible 2012 contenders. So Delaney’s entry into the race, well over 2 1/2 years before we deal with the snowy Iowa caucuses, either means Democrats are just chomping at the bit because they think they have 2020 in the bag or they are just trying to extend the perception of Donald Trump’s unpopularity. And who knows? The 2020 field for the Democrats may make the 2016 GOP field look small in comparison because EVERYONE who thinks they can be President will give it a shot. Maxine Waters, anyone? There’s only been one President who was elected from being a sitting House member, and that’s James Garfield. (Technically, Delaney won’t be a sitting House member when elected since he’s dropping out of Congress after three terms.) Even so, I think that 140 year streak will be safe. But in any battle someone has to charge forward and take the arrows, and it looks like John Delaney is that guy. The only question is whether he will be first in, first out. And somewhere Larry Hogan is breathing a sigh of relief. I’ve thought all along Hogan was most vulnerable to a Delaney challenge given their similar backgrounds, but it appears John has more ambition than to just be governor. It’s become obvious that the junior Senator from Kentucky has become quite the item in Maryland, since he will be engaged in Free State-related causes supporting state political action committees twice in the space of slightly over a month. In this case, though, the support will be more indirect. Instead of a relatively affordable event, though, it seems like Dan Bongino and the Conservative Victory PAC are going for more of the high-dollar donors. Perhaps that’s a function of holding the event in Washington, D.C. but the event doesn’t seem to be aiming for the attendance figures the Maryland Liberty PAC will be seeking a month later – of course, Bongino needs the money in a more immediate fashion as he prepares to presumably take on the deep pockets of incumbent Congressman John Delaney. 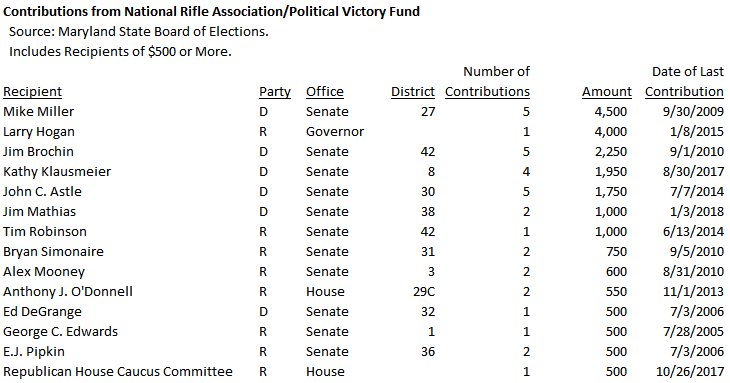 Rand Paul, by the way, is no stranger to the Conservative Victory PAC. He also was a featured speaker at a rally last October for Ken Cuccinelli, who narrowly lost the gubernatorial election there and was being mentioned as a candidate for U.S. Senator himself before quashing the rumors in December. For its part, the Maryland-based CVPAC took criticism from some quarters for supporting a candidate in Virginia. (I didn’t have as much of a problem with it.) The October event even featured Bongino as a “special speaker” so he knows the group too. We are launching this year in high gear with a fundraiser in February to support Dan Bongino as the next US Congressman from Maryland’s sixth district. In March, we will roll out a multi-tiered plan to conduct fundraisers as well as grassroots outreach as part of our victory campaign for high caliber Constitutional Conservatives seeking elected office. That statement was the introduction to the CVPAC January newsletter, available on their website. Presumably they are working on a list of candidates to support in local and perhaps statewide races. (I can think of a couple local candidates who can use the help as they face off against entrenched Democrats and their high-dollar consultants from across the Bay.) So I look forward to seeing if our humble little side of the state is included in that victory campaign. And if Rand Paul wants to help us out, he’s more than welcome to.